With Noah chatting about the future and wanting to be an architect, getting teased about his interactions with Holly, and illustrating a burgeoning friendship with Glenn that involved dialog between the two, there was far too much going on with his character on The Walking Dead Season 5 Episode 14 that should have sent up red flags. Or at the very least, the music mix in the van that practically called out “you’re going to die” to Noah should have been a major hint. Maybe because I’d been growing to like the character, or maybe I assumed one of the other newbies would have to get it because we haven’t had a death in a while, but I wasn’t prepared for Noah to die. I wasn’t nearly prepared for the gut punch of a scene that was both gruesome and emotionally distressing. Add in the fact that Glenn had to watch the horrific moment from behind the glass, and his reactions (a standout performance from Steven Yeun) at seeing his friend dragged away and then ripped apart made the scene that much more affecting. I was tense enough just watching the walkers try and push through the revolving door, that later seeing them able to grab Noah as Nicholas was able to get out made my heart sink and cringe at what followed. This was a character death that really left an impact, and I’m sad that Noah’s time was up. 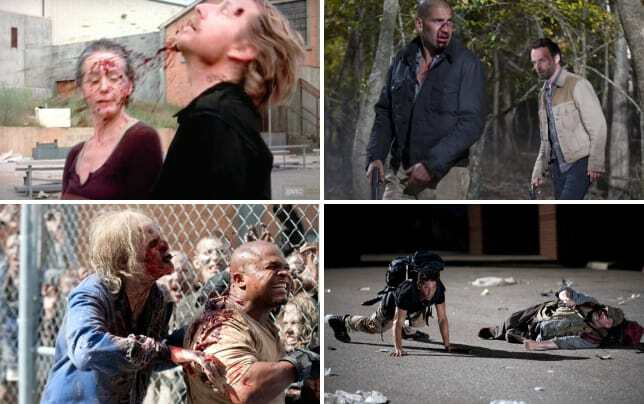 After all the calm that’s taken place in Alexandria over the last two episodes (The Walking Dead Season 5 Episode 12 and The Walking Dead Season 5 Episode 13) combined with the fact that the group needed to go on a run into a darkened warehouse outside the walls, I knew the show was due for some graphic zombie victories. I wasn’t all that surprised that Aiden was killed, though bringing him back to only later be ripped apart in a similarly bloody and visual manner was tough to watch. He may have been confrontational, but he wasn’t evil like The Governor or enjoyed eating people like Gareth. That was a really unfortunate way for him to have to die. It looks like there’s only one of Deanna’s kids left, and that’s certainly going to change things with respect to Rick and his group and her relationship with them. 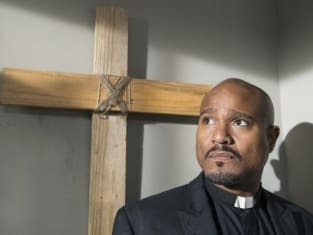 What’s more, Father Gabriel running to her and saying to not trust Rick and the survivors is really going to shift things less in their favor after Glenn, Eugene, Tara and Nicholas return without her son. 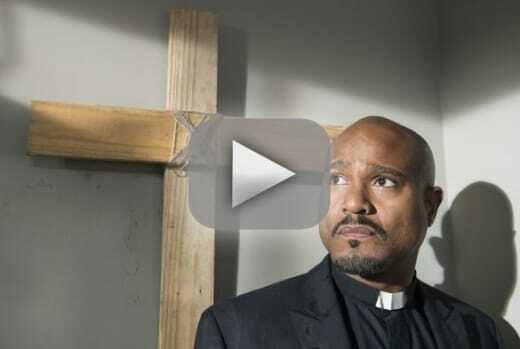 Can I just say, I’m not a fan of Father Gabriel? He’s been nothing but trouble so far. It’s clear that the Alexandria people seem more apt to run and leave their fellow people behind, where someone like Abraham or Glenn risk their lives to save someone they barely know. And you’ve got to give Eugene some props for stepping up and getting Tara out, trying to flip the script on his coward status, even standing in between Nicholas and the van when he tried to get away. I love the way the show has twisted the story around in such a way that Rick and the survivors appear to be the bigger threat; the more experienced, sure, but also the more dangerous. I loved that her past and her interactions with Sam (which I enjoyed his persistence in getting her to make cookies and chat with her even after her scary threats to him) clued her in that Pete was abusing Jessie, and possibly Sam. It will be interesting to see just how Rick handles that situation, seeing as he is living in civilization again. He can't just go to the home and kill Pete, right? Plus, Rick's priorities may have to be focused on what happens after Glenn returns. Might there be a battle on the horizon between Rick and the survivors against Deanna and her Alexandria people? This was definitely the hour to push the season towards the home the stretch, and as much as I'm bummed Noah had to go, I'm eagerly looking forward to seeing what's in store for Rick and the survivors as The Walking Dead Season 5 heads towards its finale. Were you shocked Noah died? What will Deanna do? What will Rick? Sound off below, and be sure to watch The Walking Dead online at TV Fanatic!